Funnily enough, my audiobook experience of ‘Law and Disorder’ by Tim Kevan was virtually identical to my experience of the #iPad2 #kindle version. Tim Kevan is the author of ‘Law and Peace’ and ‘Law and Disorder,’ which are both published by Bloomsbury and available on Amazon. For further information, visithttp://www.timkevan.com and http://timkevan.blogspot.com. Tim has a very dry, but hilarious, sense of humour, and his characterisations are extremely clear. I recognised every single one of the character types in ‘Law and Disorder’, can visualise graphically some of the places in London referred to, and even though I am extremely unlikely to go anywhere near an Inn, apart from to attend an academic lecture on a topic which interests me, like human rights, I now have a handy picture of life as a barrister. It doesn’t matter to me that my graphical representation of life as a junior barrister is probably as accurate as life as a Cambridge undergraduate, graduate or Master, after reading or watching Tom Sharpe’s brilliant ‘Porterhouse Blue’. I could recite, if necessary, certain passages from the book word-by-word; the ‘am I bovvered?’ scene is classic. Some lines are pearls of writing: for example, “Not even Barbara Windsor could have delivered the line better”. The book is undeniably fictional, as one hopes that a real life BabyBarista does not exist, but the account s frighteningly realistic. It’s impossible to enjoy ‘Law and Disorder’ without wondering what makes Tim Kevan tick, and that is of course part of the success as Tim is a barrister-by-training. Which is why, having completed ‘Law and Disorder’ (several times), I am looking forward enormously to ‘Law and Peace’. Tim’s motivation, in part, unless I have completely misread him, is to try to understand what being a very junior barrister is all about. An unfortunate side-effect of this book is that you can’t help feeling an enormous amount of pity and/or admiration for those people who have somehow survived this process, if it is depicted reasonably faithfully. You indeed wonder how on earth a select few will make it to QC, suffice-to-say that it must help to be very thick-skinned! I wished to write this review, without having read other people’s thoughts on it. Law and Disorder started life as an anonymous blog and its appeal as a novel is obvious. Tim Kevan, a former barrister himself, has a sharp eye for detail. 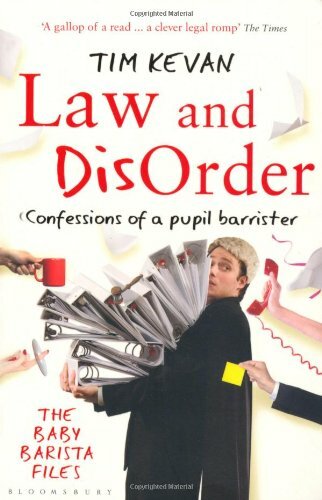 Law and Disorder was described by The Times as “a cross between The Talented Mr Ripley, Rumpole and Bridget Jones’s Diary” and Law and Peace has been described by the Daily Mail as a “funny, sharp account of backstabbing Bar life…highly recommended” and by broadcaster Jeremy Vine as “a novel bursting with invention”. They are based on the BabyBarista Blog which Tim has written for The Guardian. He is also the co-author of Why Lawyers Should Surf (with Dr Michelle Tempest). I am also extremely mindful of giving away the story – but it’s a gem. The book commences with BabyBarista’s first day as a pupil barrister. He has just one year to win through whatever means he sees fit the sought-after prize of a tenancy in chambers. Competition is fierce: there’s “TopFirst”, who has a prize-winning CV but unfortunately a huge ego to match; “BusyBody” on a husband hunt but whose life seems to be predictably unpredictable; and “Wide-Eyed Worrier”, buckling under the burgeoning dimensions of the legal world. “Litigation is like war.” So BabyBarista is told on being presented with a copy of Sun Tzu’s The Art of War during his first day in chambers. BabyB is about to discover that the battle lines are drawn not only in the courtroom but between the barristers who will be his neighbours for the next year of continual assessment in the furious ‘race for pupillage’. It is a lesson he is quick to learn – if fraud, philandering and a string of transgressions are to dictate which of the aspiring pupils make tenancy, BabyB appears to give as good as he gets. Part of you wishes to disapprove of BabyBarista’s behaviour, in the same way the Bar Standards Board most definitely would, but part of you may have some residual affection for the muddling along which epitomises Baby Barista’s rudimentary political survival techniques. In summary, I strongly recommend this book, even if you have no interest in life at the Bar, young people, or London. It’s a marvellous piece of comedy scripting, and will engender a lot of emotions in your wish to support BabyBarista’s career and personal success. It would make a great Christmas present for any student currently doing the BPTC, for example, hint hint ….! In a weird way, this book I feel would be incredibly inspiring for anybody about to start their long journey with an Inn of Court here in London. Bring on, ‘Law and peace”!